“So why would you go to India?” people have asked. “Why wouldn’t you?” is my reply. I’ve had the great fortune to be able to visit the amazing sub-continent of India twice in the past year. It wasn’t on my bucket list (my friend suggested we go on a tour), but I’m so glad I went and really am excited to go again for the third time and bring Jeff. I love warm weather and India doesn’t disappoint. North India was VERY hot a couple of days when we were there in May, but for the most part, quite enjoyable. The north is sophisticated, beautiful palaces have been preserved and re purposed as hotels, restaurants and tourist attractions. Temples are everywhere for Hindus, Buddhists, Muslims, Sikhs. 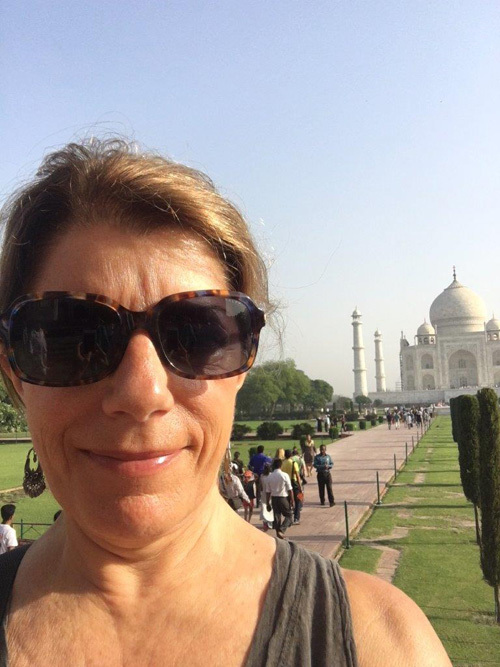 The Taj Mahal is more than I ever expected. Not so much the architecture (which up close is as amazing as advertised) but for the people who go to visit it. 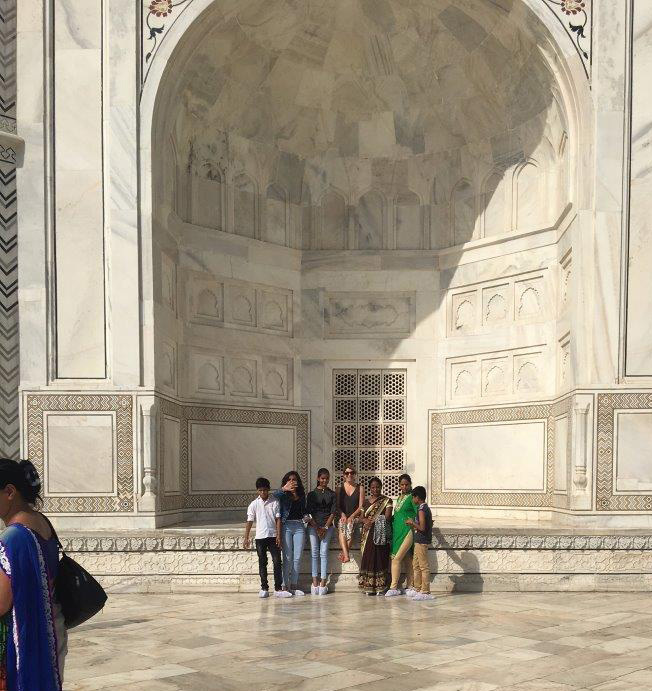 We were there near the end of “western tourist” season so there were many more Indian tourists in beautiful sarees and white dhoti’s against the marble backdrop of the mausoleum. I met families who were as curious about our little group of westerners as we were about them. Reaching out, all we wanted to do was connect for a minute, and snap selfies together. I found this all over and never got tired of that. India is a land of abundant agriculture. (I can’t speak to the slums in the inner cities as we didn’t go there.) We did see very crowded, busy cities with tiny streets and rural villages with dirt roads. Overall, it’s a vibrant population, very industrious. The open markets offered up stacks of watermelon, truckloads of onions, greens, tomatoes, potatoes, and fragrant spices in giant sacks. The colors are amazing. The tea plantations in Southern India are mesmerizing: steep hillsides with perfectly groomed tea bushes for miles. Coffee bushes have the most fragrant flowers, pepper vines grow up mango trees, and cardamom pods are at the bases. Cows and goats roaming the streets, people feeding them; traffic stopping as a herd takes over the road. 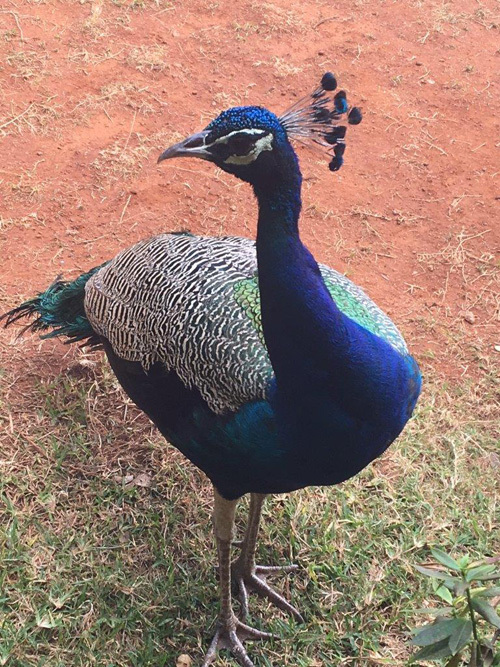 Monkeys in the trees, cheeky peacocks looking for handouts, flocks of sheep being watched over by shepherds. Something happening everywhere! South India is another world much like our southern states vs north. Tamil Nadu is on the south east side of the Ghat Mountains and the home of many ancient Hindu Temples along the coast – many are World Heritage Sites. These are not relics in the least. Vibrant colors, people, temple priests busily carrying pails of milk to bathe the shiva lingums (stone symbols of the god Shiva) as offerings. Families make the pilgrimage from far away towns and villages. 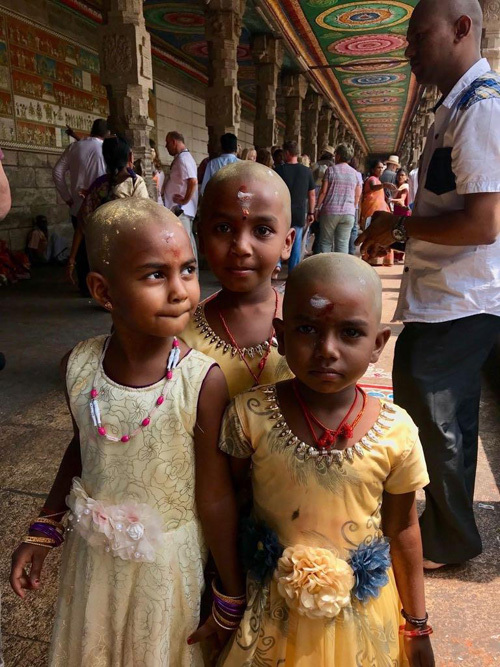 They shave their toddler daughters’ heads as an offering to the gods. 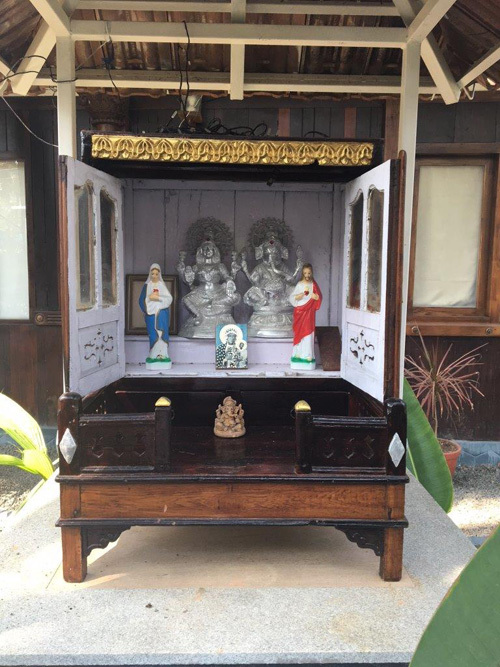 Flowers, garlands, turmeric powder, and temple prayer beads are offered for sale to adorn the beautiful statuary. Candles are lit and prayers are offered up to various gods. Temples in rural villages have festivals for fertility of the crops with drums, horns and women in bright clothes or men with turmeric paste smeared over their bare torsos. Worship is 24/7! The Portuguese settled in Cochin on the west coast and there is a heavy Catholic presence. Personal home alters contain both Hindu and Christian images – everybody is included. Crossing the Ghats your ears pop from the altitude change (over 7000 ft on our crossing) and then you enter the state of Kerala on the west coast – so different from the arid east side. It’s more humid and lush with palm trees and vines. The Arabian Sea has beautiful backwater canals. 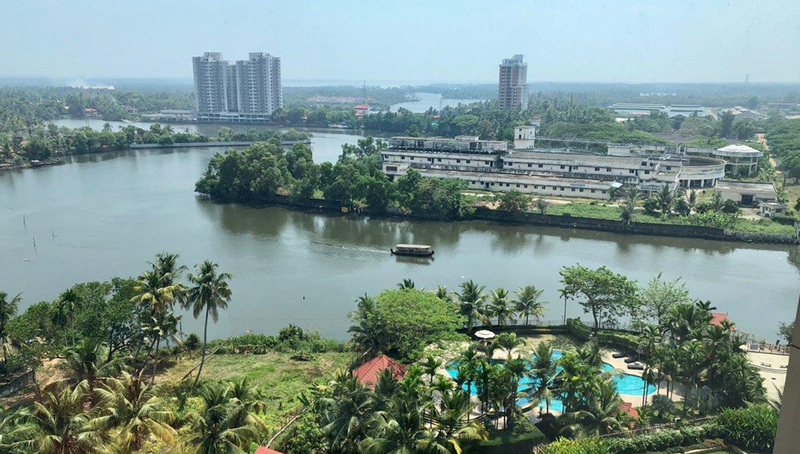 Cochin is known as the Venice of India. Some of the rice boats have been converted into tourist bed and breakfasts. Luxury accommodations as you float down a channel passing skiffs laden with bricks, vegetables, refrigerators, you name it. The land is beautiful but the people are the real draw for me. They are busy, artistic, educated and living their lives. They are steeped in tradition but modern with cell phones, satellite dishes and a thriving tech industry. Their family lives are so important. Sons do not leave their mothers until marriage for the most part. Arranged marriages do still exist (there are classified ads in the Sunday Hindu Times). I found the people were always interested in talking, learning and sharing their culture. It’s not a perfect place, but it’s perfectly wonderful! Such a beautiful description of an amazing country, Adele! Thank you! It’s easy to fall in love with the raw, sweet, colorful, playful people of India! Omnamashivaya!! Thanks for sharing your amazing journey! I read about your India adventure with great joy and curiosity. You delightfully draw the reader into the story as if one was actually there with you. You have a keen sense of observation and a good cultural insight into the lives of the wonderful people who live here. What impressed me so much when I visited parts of India, is the dignity of even the poorest people.